A dual disaster hit Pakistan in the final week of June 2007. On June 23, rare heavy rains and winds swept over much of the country, and three days later, on June 26, Cyclone Yemyin (03B) blew ashore in southern Pakistan. The two storms caused extensive flooding in the country’s southwest from the Arabian Sea coast to the border with Afghanistan. 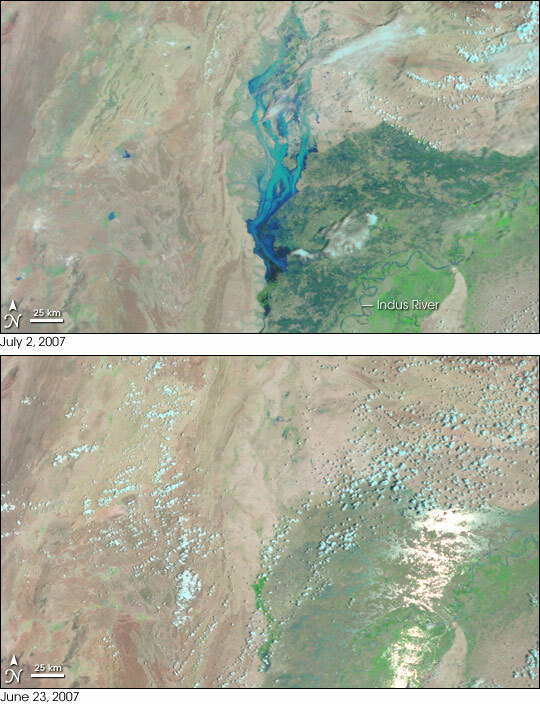 The Moderate Resolution Imaging Spectroradiometer (MODIS) captured this image of flooding near the Indus River on July 2, 2007. The large image shows additional flooding along the coast. In this type of false-color image, made with infrared and visible light, water is dark blue or black. The lighter blue color in the north is either water-soaked land or mud-laden water. 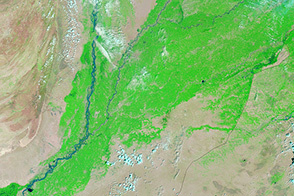 The desert landscape is tan-pink, while cropland near the Indus is green. Clouds are pale blue and white. The lower image, taken on June 23 before the storm moved in, shows normal conditions. The white streak near the right edge of the image is sunlight reflected off the wetlands around the Indus River. In the area shown here, more than 100,000 people were displaced when 800 villages were submerged by floods, said Relief Web. As of July 4, the International Federation of Red Cross and Red Crescent Societies estimated that approximately 300 lives had been lost throughout Pakistan, and 550,000 people had been displaced. You can download a 250-meter-resolution KMZ file of the flooding and comparison imagery from June 23, suitable for use with Google Earth. NASA image created by Jesse Allen, using data provided courtesy of the MODIS Rapid Response team.